Traders at a Lancashire craft centre were today counting the cost of a major blaze which badly damaged the building. Firefighters from Chorley, Bamber Bridge and Preston along with colleagues from Greater Manchester tackled a large blaze at historic Heskin Hall, near Chorley, on Thursday morning. The upper floor was badly damaged and businesses on both floors of ther craft centre were badly affected. Crews managed to prevent the fire spreading and saved the building from complete devastation. Watch manager Joe Joseph, of Chorley fire station, said the fire started near a first floor stall. 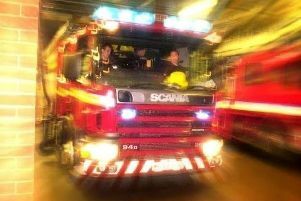 When firefighters arrived the building had been evacuated and the area was well alight and the blaze spreading across the roofline. Officers wearing breathing apparatus tackled the blaze with hosereels and managed to contain it. But there was serious fire damage to the upper floor and smoke and water damage to the ground floor as well. Mr Joseph said colleagues from Greater Manchester attended and helped the Lancashire officers explore the roof void using an aerial ladder. Officers stayed at the scene for five hours making sure there were no other pockets of fire in the structure.